I feel blessed to have a set of the most amazing and wonderful people in my life. The latest entrant to this group is my brother-in-law Mihir (my sister got married this year). Mihir is not only a food lover like the rest of us, but is also very generous with his genuine comments of appreciation which I must say make me very happy. What is the connection between my brother-in-law and this post you ask? When I made a foray into jam making, my sister was just engaged and a bottle of strawberry jam was the first gift I made to my brother-in-law. I still have the sms from him which reads “It was the most amazing thing I have tasted!’ I don’t really know whether I deserve such superlatives, considering the fact that making strawberry jam is a breeze. 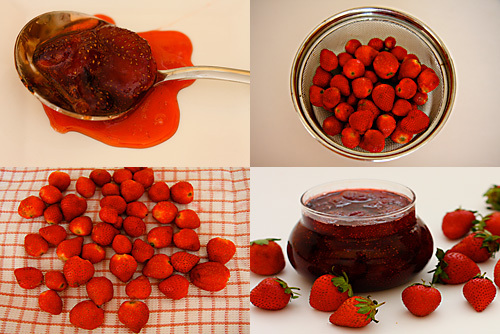 Anyone, and I really mean anyone, can make strawberry jam with the recipe below. Ever since I made my first batch of strawberry jam, I don’t think I can ever let a strawberry season go by, without making a batch of this glistening ruby red delicacy. I also can’t let this session lapse without thinking of Mihir! Associating food with people is an old habit of mine. A jamming session is a wonderful way for me to indulge in on a lazy afternoon when seasonal fruits are in abundance. And apart from filling your home with the heavenly aromas, they also make such exquisite, pretty little gifts for loved ones. Dont you agree? This Jam is based on a recipe by Moshe Shek, who runs a popular restaurant called Moshe’s in Mumbai. Sugar for me should be just right! Not more, not less. If your sugar preferences are on the higher side, you can use equal quantities of fruit and sugar. Since this is a soft set jam with pieces of fruit in it, it can be used as a topping for cheesecakes, used as a filling for sponge cakes, spread on bread or eaten as it is. Wash and hull the strawberries. Pat dry in a cotton towel. Dry again with paper towels. 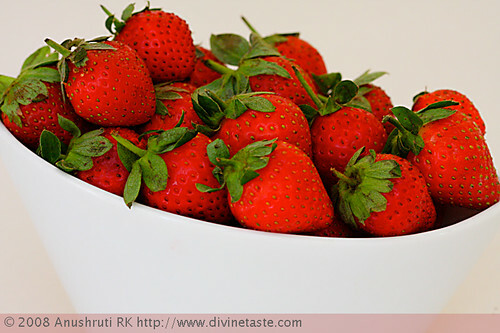 Place the strawberries on a strainer in the refrigerator for half hour. This helps to dry out any moisture, if remaining. Place a saucer in the freezer to chill. This will help to test the doneness of the jam. Wash a ½ kg/500gm glass jar along with the lid carefully. Soak it in boiling water for 10 minutes, and then set it out to dry upside down, preferably where there is good sunlight, on a clean kitchen towel. Alternatively, heat in a preheated oven for 10 minutes and allow to cool to room temperature normally. Either ways, make sure the jar is completely dry. In a clean heavy bottomed steel utensil, place the strawberries with the sugar and macerate for ½ hour. Halve some of the strawberries and heat on a very low flame until the sugar melts. This should take about 15 minutes. Be careful not to stir at this stage until the sugar melts completely. Put in the lime juice, raise the heat and cook for 10 minutes more, stirring in between to prevent scorching. Remove the foam that gathers at the surface with a slotted spoon to have a clearer jam. Take the saucer out of the freezer, and put a drop of jam on it. Tilt the saucer, and see if the jam is set. If not, let it boil for another minute, then test again until set. It should be done by now. Pour the jam into the prepared jar, wipe carefully and store in a cool place. P.S. I store this jam in my refrigerator. Oh… so now Mihir has taken precedence huh? I now have reason enough to do some jamming session this strawberry season. Thanks Anu. I await the barrels of strawberry jam! Hey Mihir…now that the recipe is online, your wife dearest can also make it for you. As it is she confirms that she is going to indulge in jamming sessions :-). Hey Anu, First off… Congrats dear girl. The website looks perfect and the way you bring out each recipe is so warm and cosy! 🙂 While reading the comments i can only second Mihir here when he calls your food 'Amazing'! Having tasted a few of your utterly divine recipes for almost 2 years. God! I still cannot forget the aroma of your saffron filled Kheer or your absolutely mind blowing pineapple cake. Sitting thousands of miles away i can smell, taste and get my taste buds rolling just thinking about it all. My comment here is going to be long so pls. bear with me Anu and the rest of the gang….. I just love the way you bring out the 'meticulousness' in your recipes Anu – crisp and to the point yet with details that will make all the difference when you start cooking! About this recipe though, the first thing that caught my senses even before the strawberries were the JARS! 🙂 And lo behold what do i see the thoughtful and meticulous Anu once again who describes the container and the saucer and the just perfect way to make and store strawberry jams…awesome! I see the Indian version of Rachel Ray and Martha Stewart in the making and only better 'cos you don't stop with just Indian, you venture into Italian, french, Thai, Chinese and i'm sure you'll be travelling all around the world one day turning people into vegetarians with just your utterly divine food Anu! Keep it rolling…. However, I wont store the jam in your refrigerator! 😛 Anyways, Anushruti, you are a true food rockstar! Hey Preethi thank you so much for your lovely comment. I'm so happy you liked the site. Rustoo, I look forward to your "sweet" comments. Your strawberry jam looks delicious! It would make a lovely gift, especially in such a beautiful jar. Your photos are brilliant. My favourite is the white bowl full of strawberries. I'm just going to head over to Flickr to see if it's on there so that I can fave it. Great post, and so beautiful. Those jars of jam looks amazing.. & indeed like what your brother in law said. What a sweet gift. Beautiful blog & beautiful pitures. I am adding u to my list. Anu akka, first of all amazing photographs!!!!! R u going to put the ones u took here too? the sri Lankan food??? I hope there's enough jam for me :)….. Anusha Liked it too :)….She said she is going to show this website to all of her frndz in Singapore :)…..
Katie-Rose: Thanks for your visits and comments. Hey Vedika… You looking forward to photos I can understand. But recipes? R u planning to venture into the kitchen anytime soon? hey the jam looks absolutely divine!!! thanks for the simple n yummy looking recipe….will surely try it! Hey..i tried this..and must say it was yummy! proof..i finished a bottle in a week! Fantastic presentation Anu. Had tried your strawberry and cream years ago. This should be as good as that one. Bhairavi: Thanks for pointing it out. Have made the eidts. Wonderful pictures.Was the Jam runny? It looks runny in the picture. Arthy: This is a soft set jam with chunks of whole fruit in it. Yasmin: Yes…you could substitute with the fruits you mentioned. However the setting of the jam would vary with each fruit depending on the pectic and based on this you would get a soft or a firm set. Yippee…Jam with no preservatives!! I'm going to try it with plums. Mixed fruits might also work well…what say?? Renu: I don't see why it shouldnt work with other fruits…but depending on the pectin content of the fruit you are using, you would have a soft set or hard set jam, so adjust your cooking time accordingly. Lakshmi: Look forward to your response. Hi Anushruti,i am new to your website and am very impressed with your recipes. I tried this jam with approximate measurements. I liked the taste,however the jam now feels a bit stringy and tough…could it be that i overcooked it?and what do you mean when you say,'Tilt the saucer, and see if the jam is set'..please clarify.Thank you. rima: I havent tried growing strawberries ever! Currently living in Mumbai, that sounds like a far fetched dream to me. Amazing jam. I made it today and all relished it. Thnaks Anu..
Anu, I made this jam!! A big hit! We have been tasting this spoon after spoon 🙂 Thanks for such precise instructions! Ashwini: Great! Thanks for the feedback! Hey Anushruti, you have made the entire jamming process soo simple..never imagined making a jam would be this easy…can't wait to try it myself…I just had one doubt , do you directly store the hot jam into the glass containers or you let it cool down and then store it ? Thanks for sharing the recipe. 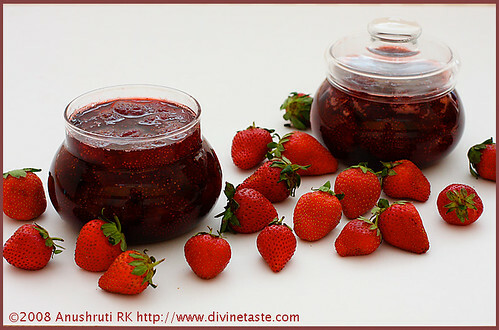 Dipti: It's better to allow the jam to cool and come to room temperature before putting it in the jar for storage. I have now crossed over and become your recipe tester 😀 As always this is a keeper! I just made some jam and it tastes better than anything I have ever tasted in the jam department! Next time, may be I'll reduce the sugar a little bit, so I won't feel guilty gorging on it 🙂 I hope it won't affect the way jam sets. Anis: Nice to hear that! I am new to jamming hence had a few queries. a) Do you shut the jars with the lid when the jam is hot? b) Any idea of what is the shelf life when not stored in a refrigerator? c) The way canning is done in US is a lil different. They shut the lid when hot and follow the water bath canning. Is it necessary to do that? I have seen my Mom storing the Murabba in dry sterilised jars which stay safe for years!! sneha: I dont do any elaborate canning techniques. My jams last for a good couple of years in the refrigerator. I havent tried not storing in the refrigerator so I cant really say but a week to 15 days should be my bet. M back again to try another recipe from your blog.last time it was Oatmeal raisins cookies thistime around this jam.My SIL is a HUGE,CRAZY fan of strawberries….i did store few (around 1/2 kg strawberries in the freezer…m planning to make some for her …BUT my sweet madam ji is on diet now so she is avoiding sugar intake…my questions 1)what can i substitute sugar with….or can i cut down on sugar??? to like minimum..2)will it affect the taaste of the jam? 3)can i use frozen strawerries after thawing them for the JAM???? Swetha: I'm not sure if cutting down on the sugar here would be a good idea as it would alter the texture of the jam. It will affect the taste as strawberries are quite tart and the quantity I have used is not much. Strawberries don't freeze as well as other berries like blue berries but if you can't get fresh strawberries you might as well use frozen ones. But, the end result wont be like jam made with fresh strawberries. It would be a sort of a compromise but still worth it. Good luck! Eggless lemon curd ,chiffon cake,black forest cake and glze plz yeh sab banana sikhaye. Simmi- Noted! Thanks for the request. This recipe is yet another keeper. My only question is that me and my husband do not prefer big chunks of fruit in the jam. Is it ok to chop the strawberries instead of keeping them whole ? Hi, can you suggest how to make jams using dried berries. Jams taste best with fresh fruit. You can soak the fruit in water and rehydrate them to make the jam. Or make a conserve with dry fruit.